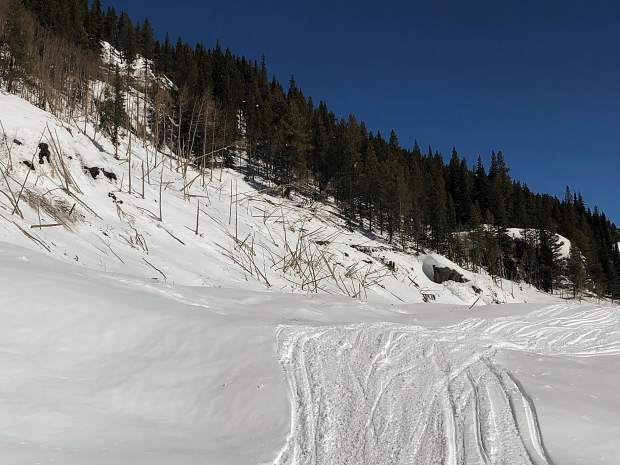 A well-established avalanche path on Green Mountain east of Aspen on Highway 82 slid earlier this month with enough volume to cover the closed Highway 82 with snow. An avalanche came off Green Mountain on the south side of Highway 82 and sent snow and debris over to the northside, where aspen trees were toppled. The sowmobile and ski tracks are on the snow covering the road. Avalanches have pummeled the western approach to Independence Pass and have clogged Highway 82 with debris in at least one location, according to the executive director of the Independence Pass Foundation. Karin Teague skied past the winter closure gate on Wednesday and found the aftermath of a large slide at mile marker 53, about 1.5 miles east of the Lincoln Creek turnoff. The road to that point was in “good shape,” she said. An avalanche path on Green Mountain on the south side of the highway slid and sent snow and debris across to the north side, where it knocked down additional trees, Teague said. While there were some tree trunks and rocks, she didn’t think the slide debris would pose a major problem for the Colorado Department of Transportation when they start plowing. Teague said it is a safe bet that multiple avalanches affected the highway corridor further up the pass, especially the Top Cut leading to the summit. CDOT traditionally starts work on the west side of Independence Pass in April and shoots to get Highway 82 open by the Thursday prior to Memorial Day weekend, which is May 23 this year. CDOT spokeswoman Tracy Trulove said maintenance crews have been so busy with open routes that they haven’t had time to assess how much work will be required this year to open Independence Pass. “Just the volume of snow is going to be a challenge to get Independence Pass open on time,” she said. Independence Pass Foundation’s popular annual fundraiser, Ride for the Pass, is scheduled for Saturday, May 18. Teague said she thinks it will be business as usual for the ride, which travels 10 miles from the winter closure gate to the ghost town of Independence. 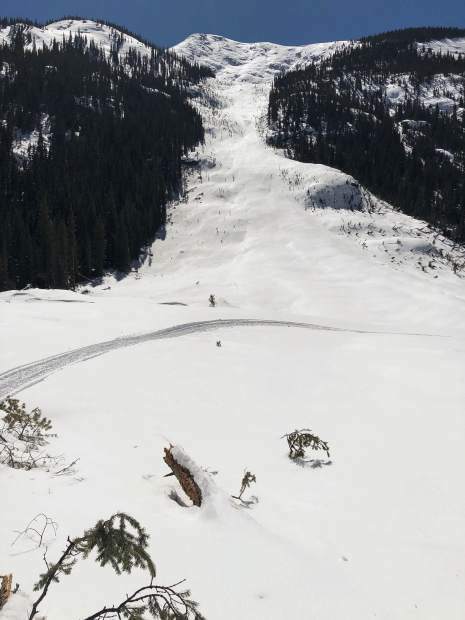 In addition to the avalanche at mile marker 53 on Highway 82, Teague said she saw numerous slides up Lincoln Gulch, about 10 miles east of Aspen. “From my vantage point, you could tell there was a lot of avalanche activity up Lincoln Creek,” she said. There are two popular campgrounds maintained by the U.S. Forest Service in the valley as well as designated camps along the creek. There are also numerous popular hiking trails. Teague said the north ridge of New York Peak slid as well as sections between Weller and New York Peak. She saw numerous slides in the Brooklyn and Tabor gulches. Teague also exchanged emails with the caretakers for the water diversion system at Grizzly Reservoir, Glenn and Kim Shriver. They reported that nearly all west-facing mountains had slides. An avalanche path along Grizzly Creek slid and “took down a bunch of timber,” they said in their email. The facilities at Grizzly Reservoir were also affected by a slide. “We had two avalanches fall together and come over the top of our gatehouse and some equipment. Made a real mess,” the Shrivers told Teague.